I promise this is the last time I’ll blog about these signs–because I am officially done making my supply signs!! I made a ton today for all of our community supplies because EVERYTHING is going in these little baskets this year! So I have a bunch of these for our supplies around the room, but compiled the most typical ones to share on here. If you would like to read more about how I set up these baskets (and access some more free files) you read all about it here: Community Supply Baskets. But wait!!! Before you go! I have to tell you some exciting news! I got an email from our principal today saying my room was one of the classrooms already cleaned and set to go for the next year. I can’t believe it! It’s never ready this early–we just got out two weeks ago! So, I could just say it’s the beginning of the summer and relax and forget about it. OR…I could fly in and set up early next week and NOT go back until school starts at the end of August, which would be something totally new for me. Oh, Kristen! Thank you so much for these…I was going to try to make some myself because I didn't want to bother you…but yay!!! Now, I don't have to, because you are so stinkin' awesome! In my opinion (and what I did) go in, set it up and then sit back and relax!!!!!!!! My room is ready and I'm not thinking about it until August! Thanks for the signs they are very cute, and helpful. Wow, thanks for sharing. I need to invest in the circle-cutter-thingy 😉 so I can use all your wonderful resources! Lipstick, highlighter, it's all the same – just don't forget to wear makeup – the kids notice that! Thank you so much for sharing these! I love them! Lucky!!! I can't believe your principal was nice enough to email you and let you know that. Great labels! You are on a roll Kristen! I love these labels. I know what I would do and probably what you will do. I am probably going to head over to school tomorrow to do a couple of things but I have a lot less summer vacation than you do. Thanks! Thank you! Just what I needed! 🙂 Love your circle designs…and the flipped ones are so much fun! Thank you!! These are so cute. I can't wait to use them. I'm a procrastinator and I would wait to go in. I just love my summers too much. I try to forget about school in the summer time and I always feel so refreshed at the end of summer for another year. It just works for me. Thank you! I love these and they will look perfect in my newly decorated room for the year. You and your ideas are AWESOME!!! I would totally be up at school!!! My room isn't ready yet! 🙁 they are putting in tile! I just printed off your other supply signs and letters for my word wall! I love them. I have to ask how you made the circle ones with the little dots around the edge. Is that a clipart item or something you make in word? I love your stuff, Kristen!!!! LOVE, LOVE, LOVE!!!!! Love, love, love at first sight! Thank you so much for doing these and giving them away!!! NONE of us are allowed to go in until August 6 or something like that, when admin. goes back. They take our keys away on our last workday! Otherwise, I would totally go in early, get it all set to go and not be in a frenzy those few days before the kids show up. And I know I would do exactly the same thing. Cute signs! I say go back in now. My advice is a little biased, since that is what I am doing now. I like to have as little stress as possible during back to school, where you can worry more about lesson plans then classroom set up. Plus, if you need more time for something, you have it now rather than in August. The labels are so cute! I would be ambitious and get it done now. That way you have peace of mind! You are so lucky you have a principal that lets you go in early!! My principal sadly doesn't seem to understand how long it can take to set up a room just so and last year I was not allowed to set up until the Monday before school started which drove me bonkers after being changed from first to K. (I had to change rooms as well as set up and plan. Sigh) So far this year, a co-worker and I have decided to be sneaky and ask the custodians to let us in to start once our rooms are done. So from this I am sure you know my advice is go ahead! You are now my go-to blog. Sometimes I log in and you are writing about exactly what I am thinking about. Like this morning! I went by my room yesterday and found the floors stripped and cleaned. Found the custodians and they said all they had left to do was vacuum. I spent two hours cleaning out and revitalizing. Today I am going in for more. Can you imagine having those last two weeks of summer NOT full of panic? The ability to stroll in for in-service days two days before school starts with the only job being the printing of finalized class lists is my dream. Get it done, girl! And then (if you are anything like me)you can truly enjoy your summer. THANK YOU SOOOOO much!!!!!! You are simply AMAZING!!!!! Amazing!! Love them. Thank you for sharing. Thank you so much for sharing. How do you make your signs? What computer program do you use? Where do you find the fonts and clipart? If I could get in my room (and I can't), I think I'd go in once a week. Then, I wouldn't be mad-dashing it the week before the kids come which makes me exhausted and no fun to be around. I mean, obviously, that's the perfect way to start a school year so I don't know why I'm trying to change it up. So I say stick with me. Mad-dash it the week before the kids come. Hi! 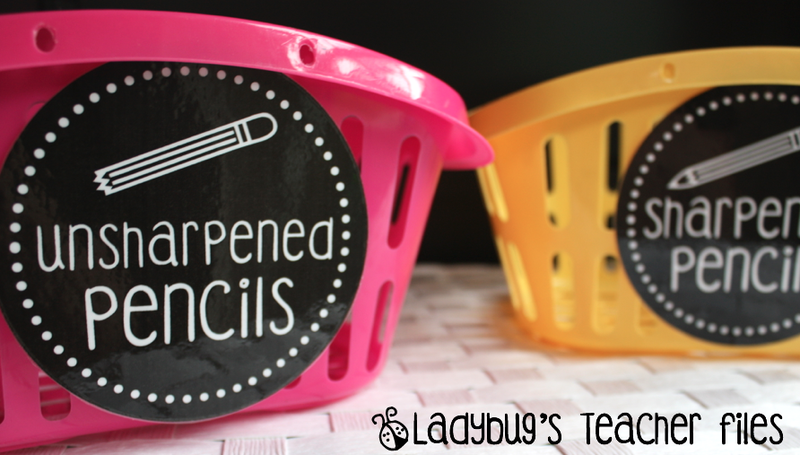 Thanks so much for the lovely freebie — I will be using the sharp/not sharp pencil signs in my room next year, for sure! Kristin, Where did you get the baskets for your community supplies? Thanks for sharing. These signs are awesome!! Thank you for sharing them! Do you have one that is just blank? Thanks! I don't at this time, I'm sorry! Ahhh……I'd seen these pics from your classroom somewhere, and then I couldn't remember where I'd seen it!! I'm so glad that I ran across it again!! Thanks! 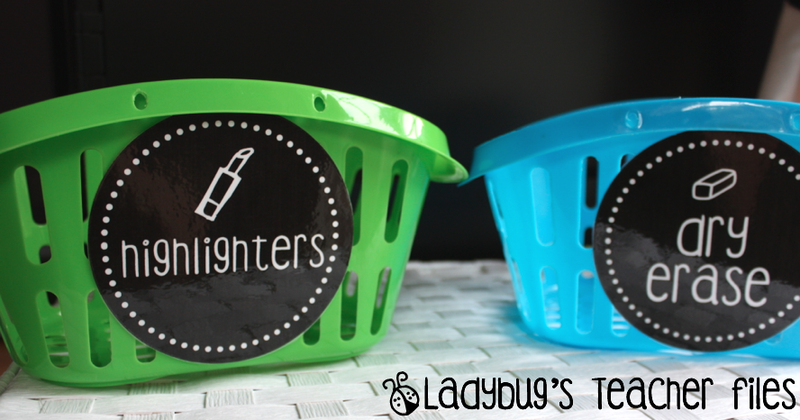 I'd really appreciate it if if you could add a link to this post in my FREEBIE classroom décor linky party. and link up any other classroom décor posts. Lord knows you have so many! I'm sure my Irish followers would appreciate them hugely! Is it possible to make a lost and found circle, too?